Eating is an essential part of Italians’ life. Italian food is known all over the world. But what you don’t know outside Italy is that some local foods are eaten in a particular moment of the day or in a specific situation. Think about pizza! Along with gelato, it is one of the preferred street foods by Italian people. Indeed every region has its favourite street food. 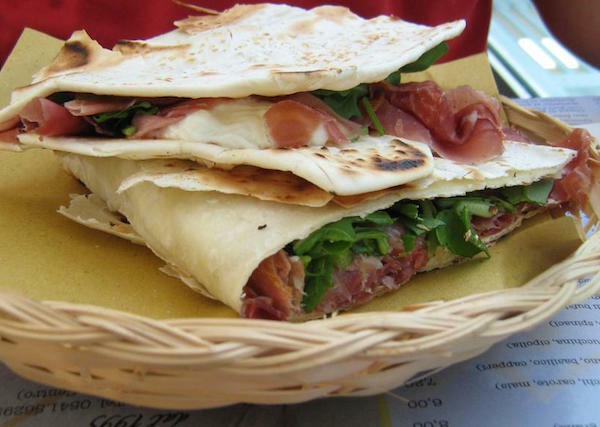 In Romagna you will find the piadina romagnola, that is a sort of a flatbread to be eaten with cold cuts, vegetables, cheese or other ingredients. We are in central Italy along the Adriatic coast. Romagna is the eastern part of the Emilia-Romagna region and piadina is typical of this territory. When you have nothing in the fridge at your own place, the best solution is to go out and order a piadina. It’s easy to find it in the whole region, but it is quite common also in Le Marche region. Don’t confuse it with crescia marchigiana, that is made also with eggs. Giovanni Pascoli, one of the most important Italian poets born in San Mauro di Romagna, nominated the piadina as “the national food of Romagna’s people“. Piadina romagnola is a flatbread made of wheat flour, lard or olive oil, salt and water. Once it was cooked on a terracotta disk called “teglia“, but today they use a metal slab or refractory stone plate called “testo“. In Umbria there is a testo as well, but it is made of cast iron. Cassone is a raw stuffed piadina that it is closed and than cooked, while the simple piadina is first cooked and then stuffed. People who live in Romagna call it ‘piada‘, ‘pieda’, ‘pida‘ or ‘pié‘ depending on the specific area they come from. Probably the name derives from the word ‘pita‘, as we saw for the Neapolitan pizza. If you have ever eaten pita in Greece, you can image how a piadina is: a rounded thin disk of unleavened dough. In 2014 Piadina was registered in the Italian list of the traditional agro-food products. There are 2 official types of piadina: Piadina Terre di Romagna and Piadina Romagnola di Rimini. The first one is smaller than the second with a diameter from 15 to 30 cm. Along the coast (where Rimini lies) Piadina is thinner (3 mm instead of from 4 to 10 mm) and larger (from 23 to 30 cm). In ancient times people used to eat loaves made of different types of flour. Then they cooked them on red-hot slabs. Probably the Etruscans taught how to cook cereals to the Romans influencing their cuisine. Romans began to cultivate barley, which they substituted with spelt, typical of the upper part of Lazio region, and then with wheat in the 4th century BC – in this period the first leavened bread was prepared, even if the unleavened bread remained very popular. Flatbread was a food for the rich because in short time it became uneatable for its hardness when cold. Romans used to eat cheese with it. Due to new taxes on bread and to the obligation of giving part of the wheat to the Lords, people began to eat flatbread more often. Flatbread was made of non-taxed cereals flour, such as spelt or sweetcorn. Do you know that in the same period the word Lord was born in England? It derives from Hlaford, which means “bread watchman”. In fact the Lord distributed the bread to people. His wife was the Lady. The word derives from Hlaefdige, which means “bread kneader” because she produced the bread. In the Renaissance in Europe culinary art developed and the first culinary schools were opened. Every Italian region started to produce its own type of bread. Unleavened bread gradually lost its importance, but was still eaten above all during the famines when they were made of acorns, brans or even sawdust! In the beginning of the 20th century Piadina was brought back to the top. It was eaten with sausages, salami, boiled cabbage or pig head sausage. In the ’40s and the ’50s you could see the first stalls along the streets selling piadina with porchetta, char-grilled sausages, tomatoes, aubergines and so on. Today piadina is consumed daily quite as bread in other Italian region. Why don’t you try to make piadina on your own? Subscribe to download the recipe.